After two weeks of fun in Belize, I am back! I can’t believe how much we packed into two weeks – without feeling rushed. Sigh. Once I go through my pictures (762 for mine alone! ), I’m going to do a full recap. 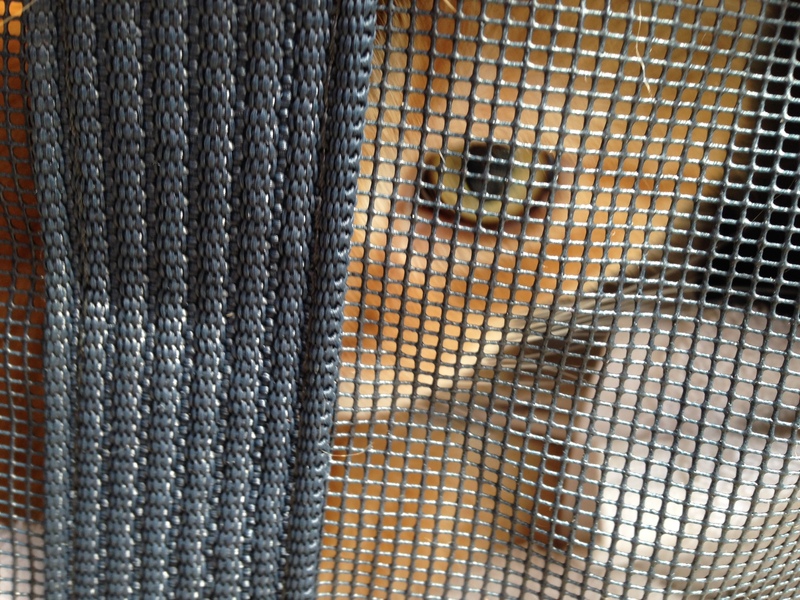 The first order of business was to pick up Boss from the “kitty condo.” Between his poor kitty hips and his 15 years, he’s developed “litter box issues.” (it usually ends up next to/half in/around/under the box and litter pads.) We figured it would be best for him (and for the floor) if he had some company. There were no meows on the way home, even when he peed himself. That mellowness lasted until night. He has his routine: sit near me, run off for more food, snurgle pants for a while, then head to my feet zone. Last night it was more like: Face! There’s your face! Feet zone! Feet zone! Pants! Pet me!!! Now I step on your pillow! 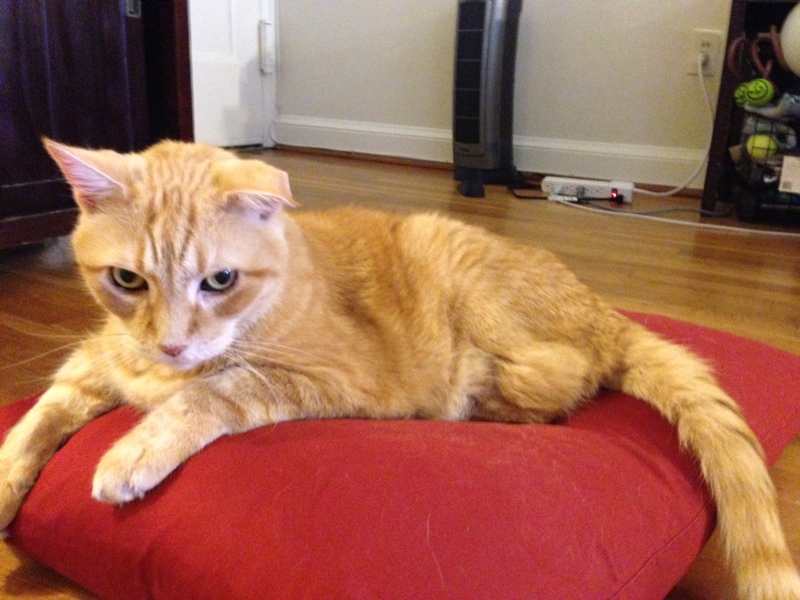 I sit on your pillow! That’s your head? Ok! Step, step, claw mouth, sit head. Snurgle. At one point, I actually had to wake Pants to get Boss off my head. I know he’ll be fine in a few days. I’ll catch up on sleep eventually. I sit on my pillow, I sit on your pillow. Since my concussion, I’ve been working out at most 60% of what I used to do. Part of it is detraining – if I’m not doing anything, I can’t expect to be as fit. Not fun, but I always expect I’ll get better. Yesterday I had a bit of a smack down. I had two appointments in the morning. I rode my bike, thinking I’d go for a long ride after PT. Well. The ride was only 35 minutes, but it was mostly uphill. My heart rate got up to as high as it’s been recently. It felt GREAT. When I checked my heart rate monitor, I noticed that my heart rate was elevated for the longest time in over a year. I was thrilled. During my 20 minute de-sweating, clothes-changing time, I was ready to celebrate with my PT. By the time she took me for my appointment, I was ready to sit in a dark corner. I had a headache, was dizzy, and my balance was off. Humpf. Loss of balance was one of my most noticeable symptoms of my concussion. I went from teaching barefoot balance training to being unable to walk a drunk walk line. Over the year, I’ve been working on getting that back. And the headaches. I consider my “concussion headaches” as something very specific. Only on one side of my head, in a very specific spot. She did some manual techniques to bring my headache down, and I went home. Be careful. I know you want to get your body going. It’s fun, it feels great, heck, it feels normal. But headaches don’t feel normal. They feel crappy. Even if you feel amazing at the time, still cut it short. Cutting short one day will make it possible for you to do something the next day. Because the discomfort is always worse the next day. You like reading, right? Well, you can’t read when you have a headache. You like riding your bike, right? Well, you can’t bike when you have a headache. You like petting Boss, don’t you? Well, at least you can pet the kitty when you have a headache. Go self, pet the kitty. Pet that kitty good. Pants has been putting in some extra hours finishing up a project lately. 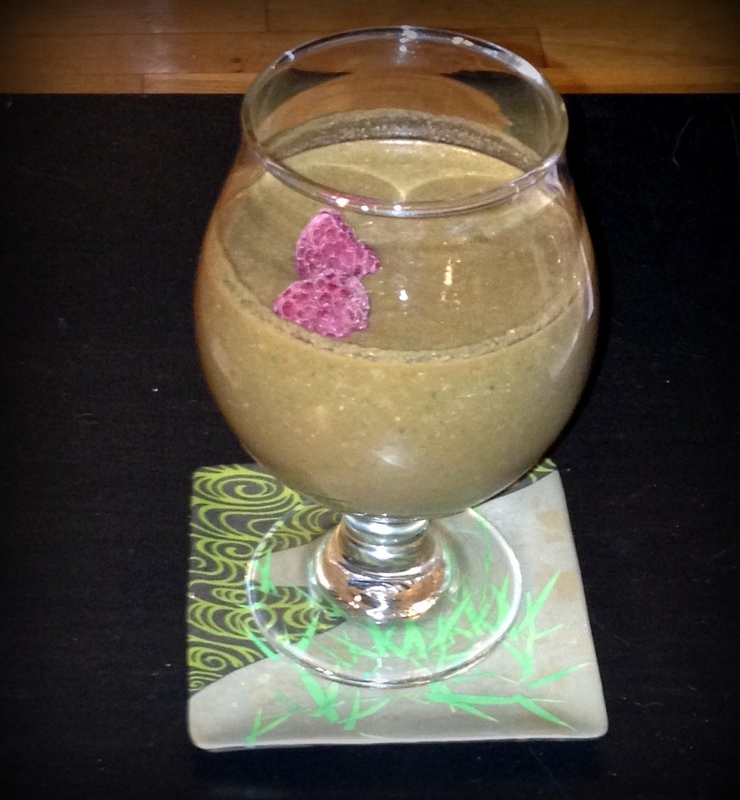 The poor guy was yawning through his cup of coffee last night, so I wanted to make him an extra-special energy smoothie to start off the week. I love making this little number on birthdays or big exam days (it actually originated when I had a big exam on my birthday). The chocolatey goodness not only makes me feel totally spoiled, but also peps me up and keeps me going for hours! Note: one look at the ingredients list will tell you this is NOT a light smoothie. Enjoy! Place all ingredients in the blender in order listed. Blend at a lower speed until everything is mixed. You may go. Suitcase must stay. I’ve heard from some of my dog owner friends that their dogs get anxious at the mere sight of a suitcase. It seems so sweet that the poor pups would miss their owners so much. Not our Bossy. 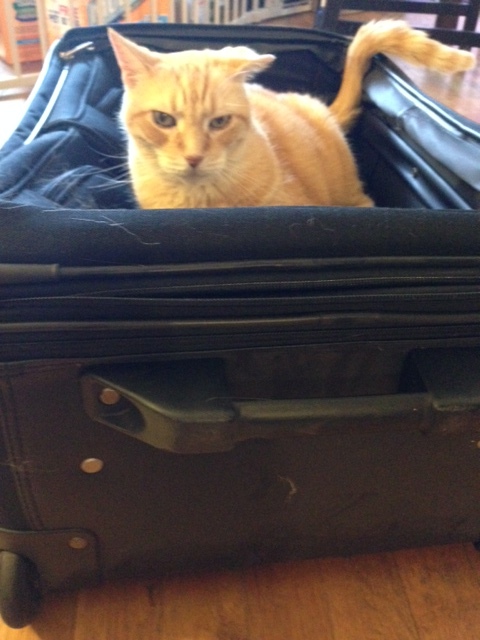 When he sees a suitcase, it’s like a motel “vacancy” light goes on. No sooner had I set the suitcase on the floor, then that little fluffer got up (out of his box) and jumped right into the case. Sheesh. We wanted to do a test pack to see how much room we had and what we needed for our trip to Belize. I’m really hoping to keep it as light as possible while still enjoying a “fresh pair of this” and “a clean one of that” every so often. You know, if you got rid of the hiking boots, I could bring my Beef Feast in here. We planned on splitting one suitcase to cut down on draggables. I like my stuff to be organized and as hassle free as possible, so I usually use the Eagle Creek packers I’ve had for about 15 years. I’ll start with stuff organized by clothing type, and finish with stuff separated by “dirty” “mostly dirty” and “dropped in a mud puddle.” My gear fit right in without crossing the middle line, shoes and all. Spotting a vacancy, Flueff hopped in to let me know how to use the other half. 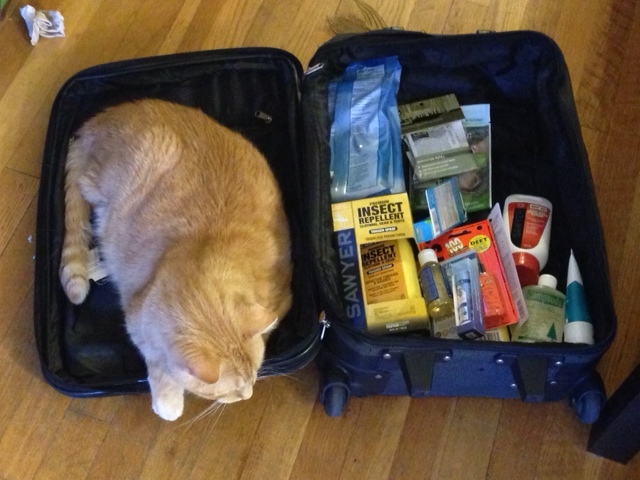 I wasn’t sure if we could also fit in our sunscreens and bug sprays, so I pulled out the carry-on to gauge the space. I get lefties, you get righties. Eventually he got up, leaving a ring of orange fur in his wake. I tried to clean it up with the lint roller, but the suitcase itself seemed a little more adhesive. I’m going to miss that darn Flueff so much, every leftover cat hair I find is going to make me smile (I’ll probably try to pet it). Yesterday morning was another slug-fest, so I slapped on the NPR and set to waking up by making gummies. I’m a huge fan of grass-fed gelatin gummies. I usually go with some variation on Diane Sanfilippo’s Sweet and Sour Gummies recipe. I even got my mom hooked when she came down for a visit. Today I recreated the lemon-lime bites with spangles of mini blueberries that I made for the July 4th picnic. I find silicone candy molds the easiest way to get bite-sized pieces. Most of them look pretty cute (Pyramids! Fancy squares! ), but the dome shaped ones always look vaguely creepy, even sinister. I think it’s because they’re just a little too round, a little too shiny (and with the mini blueberries, a little too much like dissected eyeballs). With gummies cooling in the fridge, I hopped on my old steed up the hill to the nearby pool. I’m not the best swimmer, but man, do I love it. Between the biking there any home, I got in about 35 minutes road time and 50 minutes swim time. Ahh. My gummies were ready when I got home and I popped a few while I was getting ready to go back out. I swung into the Smithsonian Museum of American Art to check out the exhibitions. Modern American Realism had a lot of paintings of landscapes in America (think Edward Hopper out of the Nighthawks). There was also nifty photo exhibition of black and whites of American statues. My favorites were more of an abstract piece and a sculpture. The Pop Art Prints were a lot of fun a and totally reminded me of this Roy Lichtenstein print had I had as a kid. Not sure how that one ended up in my wardrobe, but it was a major player in elementary school. I missed out on the other two (I will be back! ), because I wanted to get to the Kennedy Center for a concert at the Millennium Stage. They have free concerts at 6 p.m. everyday. I was looking forward to the classical guitarist, Piotr Pakhomkin. He went from from modern flamenco to Paganini, and was really enjoyable. By then I was starving, so I was happy to meet my fella for a dinner at Rasika West End. My favorite part was the Salmon Tandoori Tamatar, with sun-dried tomato, basil and mint chutney. Swoon. I was definitely happy for a nice bike ride home to finish the day. Poor Pants has been working like a fiend lately. He’ll get home super late, and then set the alarm to get into work early. Unfortunately, working late means that waking up is twice as hard (which is not so much his forte anyway), so the poor guy over-snoozed and ended up getting into work about an hour later than he wanted. I’ll say one thing for the iPhone alarm – I barely notice it when he sets it. Last night I decided to help out and set the good ol’ clock radio. Not only would he have the dulcet tones of NPR to lure him out of sleep, but also I hid a secret weapon in the nightstand. Just a few squirts elicited a strong “MeHHHH” from the other side of the bed. I kept spraying, just managing to avoid getting him in the face. After falling for a “Just 5 more minutes, I want to snurgle with you!” (Didn’t I mention something earlier about being a sucker for morning snurgles?) I whipped out the pistol again and went to town on his hair. He was going to wash it anyway. Despite some initial grumbles, Pants was pretty pleased that the smoothie hand off this morning came off 10 minutes before schedule. I love having a smoothie and a few gummies as a mid-afternoon snack, especially when it’s hot outside.